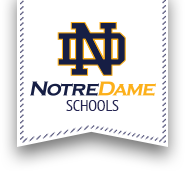 Thank you for your interest in Notre Dame Schools. We appreciate how challenging it can be as you research your options for your child's education. Why attend an Catholic school? The reasons cited over and over again include; caring environment, small class sizes, high academic standards and spiritual fulfillment. The main motive for families looking into Catholic education can be summarized in one word: quality. We encourage our students to grow toward their own level of excellence through a combination of academic, athletic, artistic, and social activities. Our students flourish as a result of this combination, and I am sure your child will as well. The best way to get a true sense of Notre Dame Schools is to visit. Prospective students and their families are given a tour of the campus, visit classes, and meet both faculty members and current students so as to get an idea of what it is like to attend our school. Discover how the Notre Dame advantage can help prepare your child to meet the challenges of life and appreciate a lifelong love of learning. Feel free to contact me at any time and I look forward to meeting with you.